Regular commuters of MRT3 will tell you – it’s a mess. Long queues, broken rails, ovenhot train interiors, stations with non-working elevators and escalators, toilets that stink, constant train breakdowns. The MRT was meant to alleviate traffic and provide commuters another option at convenience. Now, it’s more an inconvenience than a comfort. What’s wrong with the MRT3? proponent was a convoluted confusing haze of corporate vehicles really, but let us reduce these to two – MRT Corporation (the signatory to the MRT Agreement), which in turn is owned by MRT Holdings. In this Sobrepeña propaganda site, it listed down the owners, but it’s ownership is unclear, so let’s assume it’s MRT Holdings. The BLT agreement calls for the private proponent to design, construct, and turn over the system to government, while the government will operate the system and pay MRTC rental fees. When two of the major owners of the MRTC – the Agustines and the Sobrepeñas – suffered financial difficulties, they (together with other owners like the Ayalas) created another company, MRT III Funding Corporation (MRTFC). MRTFC basically issued asset backed bonds (assets meaning the guaranteed rental payments) and sold them to private companies. Back in 2007, the government was behind in rental payments, and to avoid default it decided to buy these bonds through DBP and LBP. Despite owning these bonds, government did not acquire ownership of MRT3. Remember, these bonds only represent the income from rental payments, not the system itself. MRTC still owns the MRT3. Not only is the government paying MRTC rental fees, it is also subsidizing passenger fares – Php 5.7 billion back in 2009 alone. The subsidies basically cover the real fare passengers should be paying; since the passengers do not (thanks to former president Estrada’s populist decision to reduce the original MRT3 fare price). Why is ownership an issue and a reason why the MRT3 is in this mess? Again, the government, through DOTC (now DoTr) operates the system without owning the system. Government pays MRTC guaranteed monthly rental payments. So the problems with the MRT – maintenance, new trains – are the responsibility of MRTC, not the government. The problems that commuters are facing were already apparent back in 2007. MRT3 has been operating beyond capacity since 2004. It is not clear if MRTC was remiss in its responsibility; it claimed it sent 3 proposals to DOTC since 2006, but DOTC did not act on them, or so MRTC claims. It is also unclear if DOTC did receive such proposals, nor if it decided not to act on them, why. This dispute is something for another day. But this much is clear – the MRT3 is owned by the MRTC, and it has the responsibility for capacity expansion and maintenance, being the owner of the system. The hands of the government are tied by this little piece of paper called the MRT Agreement. It is quite obvious that maintenance has been poor. Sumitomo had been the maintenance provider since the MRT3 began operation, and in 2010 MRTC abdicated its maintenance responsibility, throwing the problem back to the government. The contract with Sumitomo does not contain provisions for “penalties for malfunctioning elevators and escalators, and setting a minimum requirement of 19 trains running during peak hours between 7 am and 9 am.” The government was paying Sumitomo US$ 1.4 million per month (when MRTC should have been paying them instead). There had been no improvement since the problems became apparent in 2007, and Sumitomo has been accused of cannibalizing parts. As stated earlier, MRTC abdicated its responsibility regarding maintenance, and government took over the maintenance aspect of the system. This is the reason why the government, and not the MRTC, made decisions regarding selection of maintenance providers. There had been much controversy and noise on the decision to replace the MRT3’s maintenance provider, even leading to the sacking (or, as he claimed, voluntary resignation) of MRT3 General Manager Al Vitangcol (who is facing charges for extortion). To be clear, he was axed for conflict of interest (his uncle was one of the incorporators of the maintenance provider PH Trams). The current maintenance provider, Busan Universal Rail (BURI), has managed to restore the MRT3 to its maximum number of operational trains to 22 within a year after it got the maintenance contract. However, at the onset of the 2017 summer season, a series of breakdowns hampered operations and once again reduced the number of maximum operational trains to less than 20. This (and politics, see part III) lead to questions regarding BURI’s contract. There’s only so much a maintenance provider can do. Not only is the system old, it is also operating beyond its design capacity, reducing the life span of the trains. Sometimes the only solution is to replace the old one with the new. Operating beyond capacity with previous maintenance providers failing to maintain the system and not being held accountable for such failures, it is no surprise that the MRT 3 is in this confusing mess. It is actually quite surprising that it is still running despite these problems. All this has been worsened through politicking by politicians. The previous administration made two crucial decisions based on MRTC’s inaction: first, to replace Sumitomo with another maintenance provider, and second, to acquire new trains. However, with the change in administration, there seems to be a rather suspicious, concentrated effort by a certain politician and a certain party list (see 1, 2, 3) to discredit such decisions. For example, PBA party list representative Jericho Nograles claimed the Dalian manufactured trains are unusable, which led Senator Grace Poe to call for another hearing. In the Senate hearing, it was proven that Nograles was wrong – the only things remaining to be resolved are the feedback signal and response time issue. And with the recent breakdowns plus Nograles’ rants that the contract is onerous, DoTr threatens to terminate the maintenance contract with BURI. It remains to be seen if they will replace the maintenance provider. To be fair to BURI, it was handed a system in such terrible shape it is near impossible to fix these numerous problems. It is quite obvious the reason is not due to breakdowns (it happens most during summer, look it up). Folks, politics is rearing its ugly head. The MRT3 is a build-lease-transfer project, owned by MRTC and operated by government through DoTr. MRTC gets guaranteed rental payments with guaranteed annual return of 15%. MRTC has capacity expansion and maintenance responsibility, but it is unclear if it has shirked its responsibility regarding capacity expansion. MRTC turned over the maintenance responsibility to DoTr. DoTr bought new trains despite this not being a responsibility. DoTr wants to replace BURI with Sumitomo as maintenance provider. Current administration and its allies are bent on derailing current solutions to the mess. So. How are you today? How are you coping with the events of the past few days? Tiring, no? Kapit lang. In a democracy, dissent is essential. We have designed our democratic project so that the government will serve the people, and the people will hold its leaders accountable for every government action. It is the primary duty of the citizen to remind the leaders of government of its sworn duty to uphold the Constitution and protect the people. Once the government violates its sworn duty, once it treats its citizens like excrement, once the government turns against the sovereign people, it is the primary duty of the citizen to resist. Under a representative form of government, we elect people to be our representatives, to wield enormous powers in our behalf. We have enshrined safeguards in the exercise of such enormous powers, and once our representatives misuse that power, it is our duty to inform them and express our displeasure and opposition. They act in our behalf; if they are not acting for our benefit, they should be rebuked. How can we ordinary citizens express our displeasure with the acts and words of our elected representatives? There are simple actions that you can do, but these actions require courage on your part. Because if your elected representative is evil, he or she will get back at you if you manage to get his ire. That’s the kind of mentality each poor citizen is facing when confronting the evil of elected leaders who are intoxicated with power. You need courage. You need to start confronting that evil. How? Contact your barangay leaders. They normally have regular contacts with your mayors and congressmen. Tell them how you feel on issues and comment on the stand of your mayor or congressman on the issues of the day. If you want, you can ask them to accompany you to the offices of the mayor, vice mayor, and councilors so that you can talk to them personally. You might need to set an appointment. Contact your elected representative. See below. Contact the senators you most disagree with. Most of them are online on Facebook and Twitter. Based on experience and cursory look at their timelines, though, most of them do not take kindly to criticisms. Watch your words, be respectful but make sure you stand your ground and make your opinion heard loud and clear. Contact your elected senators and representatives the old fashioned way – by calling their offices. You can fax them if you feel that’s more effective. Contact numbers for senators are here. Search for your congressman here, then click on the name to find the contact details. Most of them are not Internet savvy, so old fashioned calling you do. Or, see next item. You can also try visiting your congressman’s district office. Take note that he or she may not be in the office most of the time, but the staff might be helpful. You’ll be surprised if they accommodate you, though. Who knows. You can contact the Office of the Vice President here. Maybe you can also set an appointment so that you can meet Vice President Leni Robredo personally. I suggest you go in a group for maximum effect. You can also contact them through the OVP social media accounts. As for the Office of the President – tough luck. Your best bet is through the Presidential Communications Office. Here’s the contact information. You can also contact them through social media, but I suggest not bothering with their personal accounts – see above regarding onion skinned senators. If communicating (or attempting to communicate) with them fails for whatever reason (most likely ignoring you, as most of them do after elections), what can you do next? That’s for the next post. The buzzword from the last presidential debate was leadership. It resonated for some viewers and listeners. A few were impressed – it was strong and simple. Inspires the people to move towards that vision. Provides the information, knowledge, and method to realize that vision. Coaches and builds a team, so that it is more effective at achieving the vision. Bakit ko gusto maging pangulo? Dahil gusto ko maging ganito din ang buhay nyo: malaya sa gutom, malaya sa takot, at malayang mangarap. Dapat natin ipaglaban ang Daang Matuwid, kung may kulang, pupunuan; kung may mali, itama natin; para dito sa ating bansa tuluyan na makapamuhay tayo kung saan nagtatagumpay ang disente. How does a candidate plan to achieve that vision? It is usually a list of principles, values, or actions that a political party or a candidate adopts. Basically, it enumerates how the vision is to be achieved. It is a covenant with the public – a binding agreement that a party or candidate is willing to be held accountable for. It is a powerful document, almost sacred. No wonder a lot of candidates are unwilling to provide concrete and detailed platforms – they are unwilling to be held accountable. Mar Roxas and Leni Robredo are willing to be held accountable through their platform – Ang Panata sa Pamilyang Pilipino. 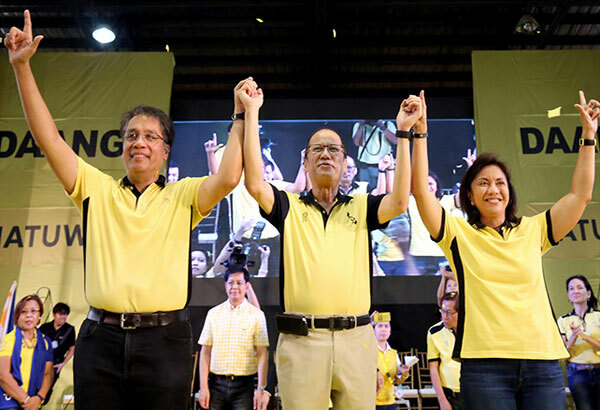 Only Roxas and Robredo have a specific and detailed platform among the candidates – a proof that they are sincere in coming up with plans and on acting on them when they get elected. A leader who has no plan will just bluster and say what the choir wants to hear, for he has nothing substantial to say. It betrays a lack of knowledge of what ails this country. It shows a bankruptcy of creativity in solving this country’s problems. A fake leader fakes it. We don’t need a fake leader. Mar Roxas is a real leader. He has a plan on how to create jobs. He has solutions to help solve the country’s problems. A leader inspires his people to achieve his vision. People will flock to a leader who inspires them to do good. They will find a leader that will inspire to achieve common goals. People will gravitate to an inspirational leader to lead them on a journey towards a common vision. A leader assembles a good team, composed of competent people who can be trusted to accomplish what needs to be done to achieve the vision. Most of the people behind Mar’s campaign are decent and trustworthy. A true leader has a good vision, he only thinks of what is good for the country. A true leader has a good plan – they go together – on how to reach that vision. A true leader inspires his followers to do their best to achieve his vision, together. A true leader assembles a good team, each capable of helping achieve his vision. If your leadership inspires people to bring out the barbarian in them, no, we don’t need your leadership. 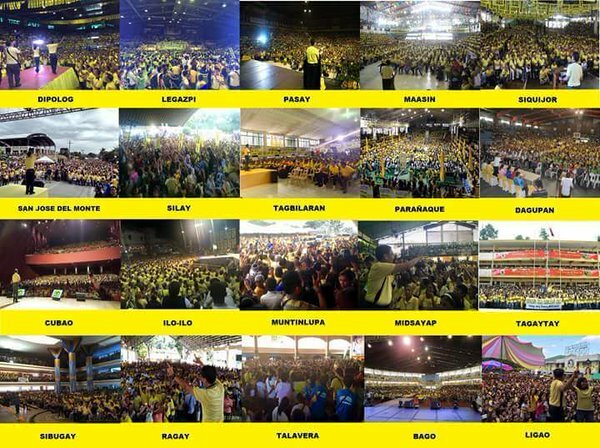 We need a true leader, and that leader is Mar Roxas. When I was in high school (way back decades ago *sigh*), it was the time when Luzon was suffering from lack of electricity. No electricity for hours, as long as 12 hours every day. So most of our time there was no electricity. No electricity meant no radio and no TV. We sought different forms of entertainment then. My mom used to buy read komiks from the palengke at Blumentritt. I remember some of the titles like Aliwan and Wakasan. Every Friday, I bought Pilipino Funny Komiks (for Combatron, mostly). When I was in my first year, my values education teacher called me Zarbot, an android character from the serial comic novel of the same name, just because my name sounded like Zarbot. Zarbot appeared in Aliwan, and his claim to fame was that he’s prolly one of the most sexually active robot characters out there. Most of the komiks back then are collections of serialized comic novels, stories being continued on the next issue. Komiks were released regularly, mostly weekly. I had to wait weeks for the next issues, because my mom did not buy them regularly. During Saturdays, I always waited for my mom from her palengke run, hoping she bought komiks. And when she did, I read them immediately, and lagi akong napipingot sa tenga because inuna ko pang basahin yung komiks instead na ayusin yung pinamili nya. Aside from komiks, my mom also bought pocketbooks. Some of these local pocketbooks were thin volumes, stapled instead of bound, with glossy cover. They were mostly love stories. I remember reading them on our stairs, malapit kasi sa bintana kaya maliwanag at pwede magbasa. She kept these komiks and pocketbooks at the eskaparate where bread and biscuits were kept. And nobody of my age would have escaped the phenomenon called brick games. These were handheld devices with monochrome displays, powered by AA batteries. They all were variations of the classic Tetris game by Nintendo. Pag may Game Boy ka that time, mayaman ka. Eh since di lahat can afford magka Game Boy, ayun, bumenta ang brick games. The more games in a handheld, the more na sikat ka. 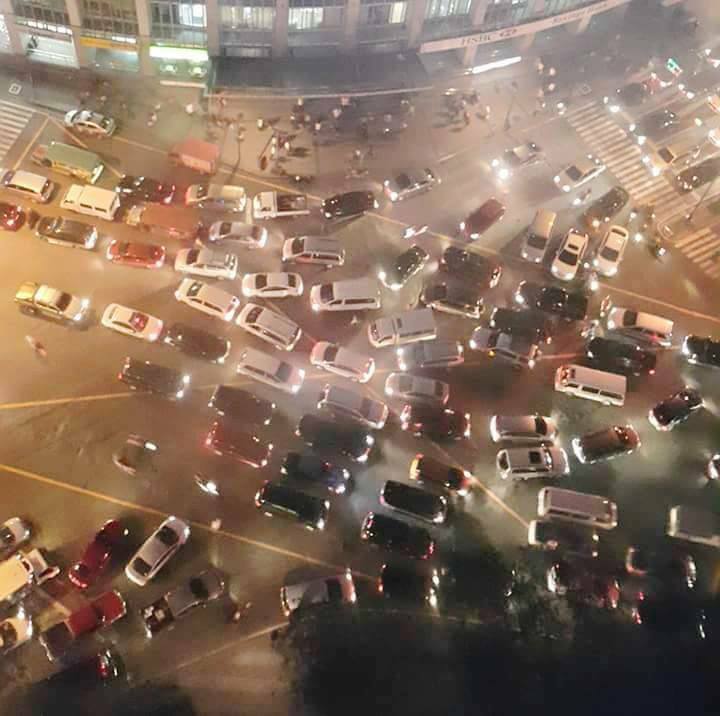 Eh 4 kaming magkakapatid so imagine the chaos – agawan eh. Di uso sa amin ang time sharing haha. So yeah. Internet at that time was almost non-existent, and mobile phones were too large to be called mobile. And since there was not enough electricity back then, TV and radio time were limited. Bihira pa portable radios nun, madalas pa AM band lang. Saka magastos sa battery. So we were left with komiks and pocketbooks and brickgames for distraction and entertainment. I don’t get the fuzz re: komiks right now. I guess it isn’t an upper class thing. … is not forthcoming in this election period. The campaign period for national posts has started, and from the way most of the candidates launched their campaigns, this is not an issues-centered campaign. Drama nga siguro ang tawag nila dito subalit realidad at tunay na buhay ko ito… katotohanan ito na araw araw pinagdadaanan ng marami sa ating mga kababayan. She tried tying up the drama of her life with the life of ordinary Filipinos. This kinda fell flat, as her life’s not ordinary. After all, we ordinary Filipinos do not get to be adopted by the King of Philippine Movies, nor get an American citizenship, nor have children that can afford expensive/fake pair of shoes that costs more than half of what a minimum wage earner gets in a month. Her campaign has yet to release its platform of government. Or maybe her 20-item bullet list mentioned when she declared her bid is it. Poe launched her campaign at Plaza Miranda, causing heavy traffic in the busy area of Quiapo. Ironic for someone who keeps on harping about traffic. Jejomar Binay launched his campaign in the busiest street in Mandaluyong, also causing traffic. For those who haven’t been keeping watch, he did not launch his campaign in his bailiwick in Makati because for the first time in decades, no Binay is sitting in Makati City Hall. While Binay outlined what he wants to do if elected president, his campaign has yet to release specifics and how he plans to achieve his planned goals. He still has to explain how he got rich. Rodrigo Duterte launched his campaign in Tondo, but not in the most depressed area of Tondo, which is in Baseco. He outlined his platform in a press conference held before he faced the crowds in Tondo. Like the other two candidates, Duterte has yet to release his detailed platform. His antics at the start and immediately after the launch (hell, even prior) are prime examples of what an issues-based campaign is not. He seems to be fixated with another candidate, alleging that the candidate is not a Wharton alumni (only to be proven to be incorrect). Recently Duterte questioned this candidate’s manhood, alleging that he is uncut (uncircumcised, circumcision being a sign of antiquated machismo-Spain era manhood). The Philippine social media follows Philippine politics. Candidates have released their platforms, and one of them has the most comprehensive so far. There’s a dearth of discussion on platforms, and I guess netizens can’t be blamed, as there is nothing much to discuss. However, the toxicity of personality-based politics permeates Philippine social media. And we’re hoping for a discussion on issues? If our candidates are unwilling to do so, what is there for us ordinary Pinoys to discuss? We are left with one candidate’s fixation on another candidate’s manhood. A few months ago, an article by a journalist led me to write about changing the way we discuss issues by veering away from personality-oriented politics. At that time I argued that we should discuss issues that are facing the country, and what are the candidates’ plans to address these issues. There hasn’t been much change since then. Senator Grace Poe was busy with all the disqualification cases filed against her (both in the Senate Electoral Tribunal and Comelec), and if she had time to share her vision, she made mostly motherhood statements and nothing concrete. She and Senator Chiz Escudero have yet to unveil their complete platform. Recently, she’s been conflating her case as a case against foundlings and OFWs, something that is clearly an appeal to emotions, a fallacy that attempts to subtly (or not) hide the residency eligibility problem that she’s facing. Vice President Jejomar Binay is busy going around the country to campaign and activate his local network (painstakingly cultivated since his years as mayor of Makati through the sister city program) while ignoring his corruption cases. 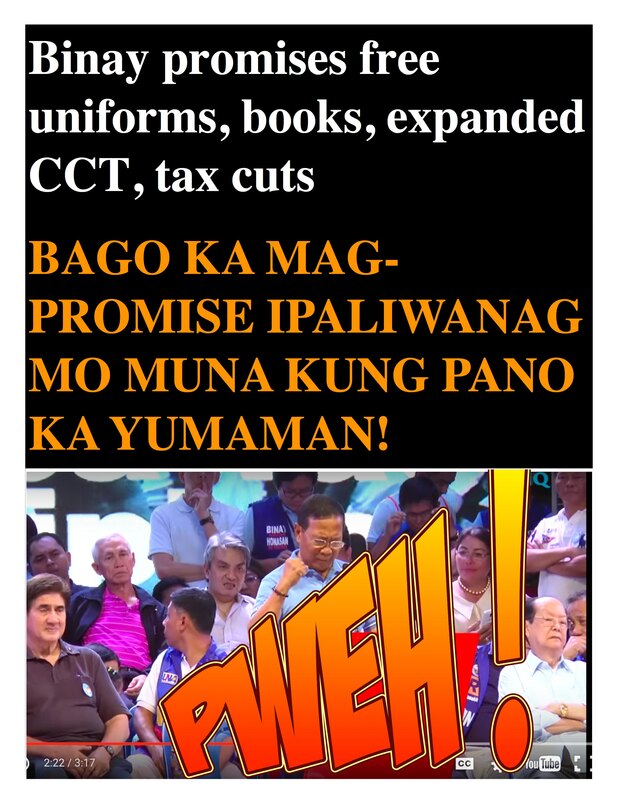 It is a move praised by some self-declared “unbiased” political analysts, as keeping his silence means he is largely ignored by the news organizations, leading the people to forget that the vice president has pending corruption cases. Senator Miriam Santiago is rarely seen and heard. 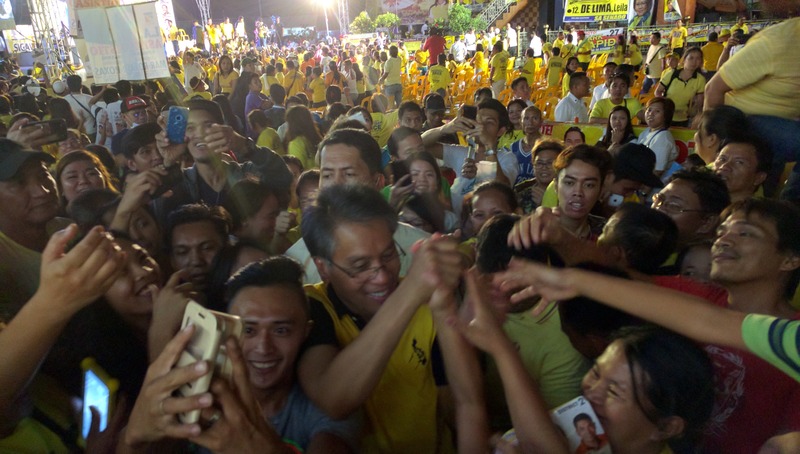 Former DILG Secretary Mar Roxas is also busy touring the country alone or together with Liberal Party candidate for Vice President Representative Leni Robredo. There isn’t much criticism of Roxas’ plans as president except on his stance on DICT. Much criticism on Roxas are on… him lying on an ice block, eating on a mug, saying “istip by istip” instead of “step by step” in a forum in Cebu. Rodrigo Duterte’s announcement of his candidacy for the position of president further lowered the quality of public discourse. The social media milieu prior to his candidacy was already close to toxic levels, but the entry of Duterte unleashed a congress of angry and hard headed fanatics who, imitating their idol unleashed coarse, uncouth, and terrifyingly threatening messages on hapless people who dared oppose Duterte’s candidacy. The sheer idiocy of some of the supporters led to a social media of demagoguery and stupidity. 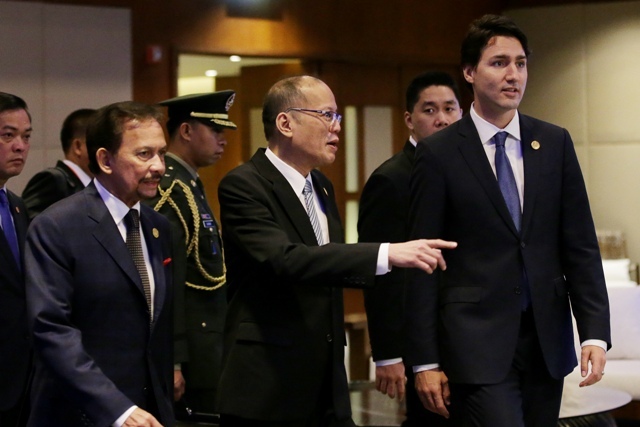 Duterte contributed to this malaise by calling into question Roxas’ Wharton degree. The resulting conflagration was unfortunate. The sheer ignorance of both so-called social and political elites and the poor masses was astoundingly shocking, and I am being charitable about this observation. It led to Roxas taking on the slapping challenge, with Duterte daring to call for a gun duel only to back down (when it was pointed out that challenging someone to a gun duel is actually a crime). Duterte then said he is ready for a debate, and Roxas challenged him, only for Duterte to retort that number 4 cannot challenge a number 1 in the surveys (the recent surveys showed Duterte as number 3 or 4, so the retort was rather flat and weak). That’s just one recent example. Heaven knows how bad it will be when the campaign period starts. We as a people have a choice – we can discuss the candidates’ plans for the country or discuss how ugly a candidate’s face is. If we want an end to personality-oriented politics, we must want it hard. We support a candidate for his or her plans and vision, not because he or she is charismatic or for orphans or tough-acting. Otherwise, by all means engage in stupidity – and don’t blame us if in the end we end up in the figurative “kangkungan.” After all, that’s where pigs wallow with glee. 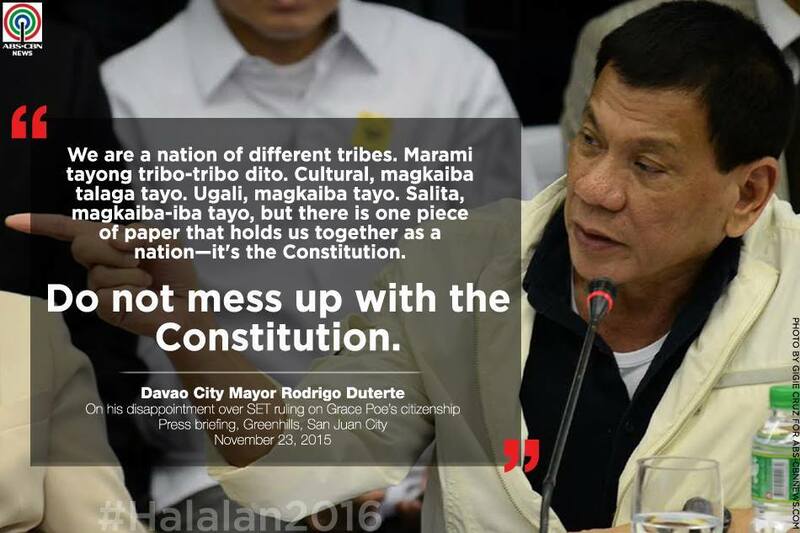 The word “Constitution” is being bandied about these past few days, no thanks to the Senate Electoral Tribunal’s decision regarding Grace Poe’s citizenship and Rodrigo Duterte’s reaction to the said decision. But what is a Constitution? The basic, fundamental law of a state which sets out how that state will be organized and the powers and authorities of government between different political units and citizens. It is basically an agreement between citizens of a state on how the government is organized, its powers, and how it relates to its citizens. Basically all actions of the government – executive actions, legislations passed, decisions promulgated by the courts – are governed by the Constitution. 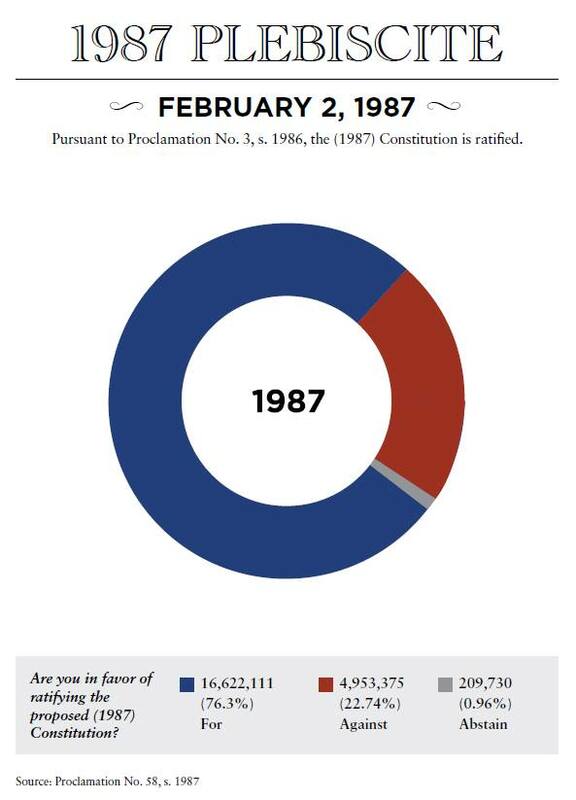 The same Constitution (in our case, the 1986 Constitution, a written document; not all constitutions are in written form, the United Kingdom, for example, doesn’t have a written constitution) also includes a list of guaranteed rights of citizens called the Bill of Rights. Basically, the government cannot act, cannot legislate, and cannot make decisions that will violate any of the rights listed in the Bill of Rights. But. Here’s the problem. The people had ratified the Constitution and its entire content, meaning we agreed on everything that is stated in the Constitution. You cannot take a part of it and disregard the others that you don’t like or does not conform with your beliefs. It just doesn’t work that way. 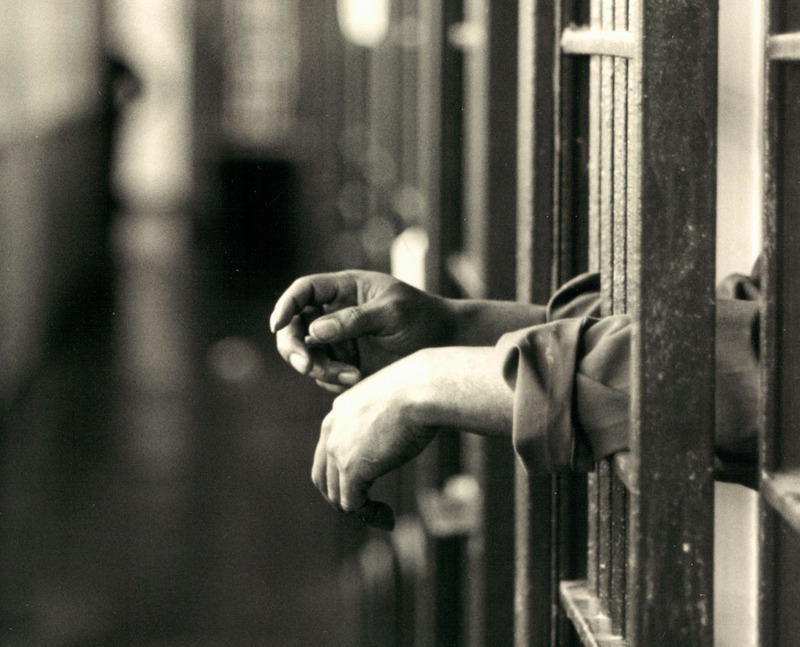 It is a very powerful provision: no one, not even the government can kill you, can detain you, or take away your property without you undergoing due process. Meaning, before the government can do anything against you, it “must follow fair procedures.” There will be investigation, you will be informed of the case against you, you can defend yourself before a court of law, and the court will decide based on evidence. That’s how it is supposed to work. We have assented to the Constitution, and we promised to abide by it. So: there simply has no place for extra-judicial killings in this country under the Constitution. If a candidate makes a bold claim that there is no messing up with the Constitution yet advocates killing suspects without due process, that candidate is paying lip service only. If a candidate admits links to a death squad, he is actually violating the Constitution. The Constitution is the fundamental law of the land. There is no middle ground in compliance. There is no compromising the Constitution. This table shows all the fora that candidates for the presidency in the 2016 elections attended or not attended. I will update this table when new fora are held. See the description for the symbols below the table. By this afternoon, the last head of state has left the Philippines, and President Aquino will be on his way to Kuala Lumpur in Malaysia to attend this year’s ASEAN Summit. The National Capital Region will go back to normal – heavy traffic; air, Internet, and noise pollution; the usual stuff. We gave a positive impression to the APEC delegates, but I am sure they know all the negative reactions online, which is normal to these heads of state/government (who have their own share of detractors and get negative comments daily). Right now, the question we all have is: now what? What did we gain from five days of hardship, inconvenience, and sacrifice? The economic benefits will not be immediate, it will take time. We can hope that we have impressed businessmen with our potential for growth, and hopefully this good impression will lead to more investments that will bring inclusive growth. That’s why it was important we put our best foot forward (so to speak). We have also proven that given the circumstances, we can host an international event. The choice of Metro Manila as host had been questioned throughout the week, and even the Php 10B budget was debated. In the end, it was obvious that only Metro Manila has the resources and venues and – yes – infrastructure (even inadequate, but adequate as compared to other cities) to host more than 10,000 heads of state/governement, delegates, businessmen, and visitors. I am also glad to see that some people finally see the importance of giving more resources and making investments in growing other cities and municipalities. It is high time we end the concept of Imperial Manila (unlike Grace Poe), and give other cities the chance to improve and make themselves equal if not better than the capital region. Let us hope our local leaders will invest time and resources in urban planning so that they won’t repeat the mistakes of the capital region: lack of open spaces, emphasis on car ownership over public transport, priority on relocating the urban poor somewhere else instead of in-city relocation, among others. Speaking of public transport: using those viral photos of EDSA wherein one side was full of vehicles while the APEC lane was empty, some people realized that a bus rapid transit might be a good solution to our transport problems. I like the idea, but like what Mar Roxas said, first our bus franchising system has to go. Let’s have all ideas put on the table and propose solutions, not shoot them down without even studying the proposals, which is what Chiz Escudero did. Finally, someone at Facebook said that we need to change our mindset, and I agree. I am glad that many people have reflected on the events of the past few days, analyzing what’s wrong, making suggestions, and acting instead of just whining. 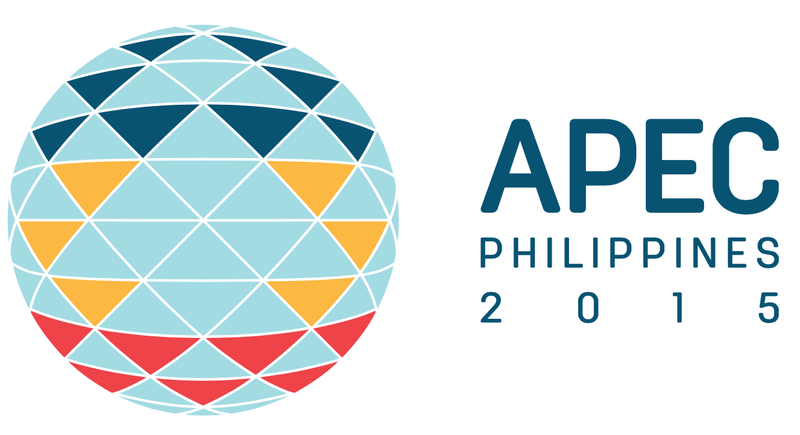 I am heartened to see social media posts of appreciation and gratitude towards those who had sacrificed and done their jobs so that this APEC hosting is more than just successful. What surprised me, though, is the manifestation in change of mindset: people realizing the implications of this APEC hosting and APEC in general. Sure, we whined and whined but I am glad that energy was later channeled towards an understanding of what’s at stake, that sacrifices had to be made, and hoping that life will improve in the process. Change in mindset: I hope it has began. I am hopeful that with a change in mindset, we’ll have a better discussion on issues and platforms. I am cautiously hopeful, as we tend to shoot ourselves in the foot, but hopeful still that we’ll make the right choice in next year’s elections.